1. 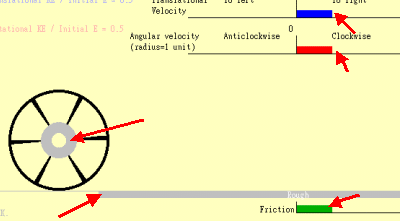 In this applet, we assume the radius, the mass and the moment of inertia of the wheel are all 1 unit. 2. The objects marked with a red arrow in the following diagram are capable to be dragged before the "Start" is pressed. 3. The two color strips shown at the bottom of the wheel are used to see whether or not the wheel slides on the ground.